The latest entry-level MacBook rolled out by Apple a week ago offers more than just an improvement on the white laptop it replaces in Apple’s notebook line. 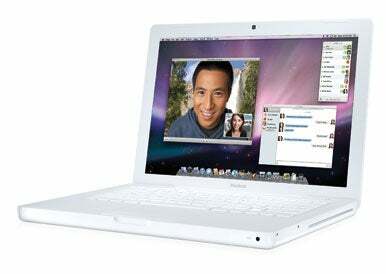 According to Macworld Lab tests, this new system outperforms the 2GHz aluminum unibody MacBook that costs $300 more. As you may recall, Apple closed the books on May with a quiet update of its $999 MacBook model. While leaving the price tag untouched, the company bumped the speed of the laptop’s Core 2 Duo processors from 2GHz to 2.13GHz and increased the hard drive capacity from 120GB to 160GB. The entry-level notebook also includes faster 800MHz DDR2 memory; the previous entry-level MacBook used 667MHz DDR2 RAM. To measure the performance difference between the new white MacBook and its predecessor, we enlisted the help of Speedmark 5, Macworld’s overall system performance benchmark. In our tests we found the new 2.13GHz white MacBook to be approximately 6.5 percent faster than the 2GHz white MacBook the revamped machine replaces. The new model had faster test times across the board, including about an 8 percent boost in Photoshop times and iTunes MP3 encoding scores. Cinema 4D was about 5 percent faster on the new white MacBook. When comparing the entry-level white MacBook to its 2GHz aluminum-clad sibling, the biggest differences are in their outward appearance and price. Both systems have Core 2 Duo processors with 3MB of shared L2 cache, 160GB hard drives, 2GB of RAM, 1066GHz system buses and Nvidia 9400M graphics. Priced at $1,299, the aluminum MacBook costs $300 more than the white MacBook, but it also has Apple’s new unibody design, including the new mini DisplayPort connector, and uses 1,066MHz DDR3 memory. The new white MacBook uses the older polycarbonate shell, has the older mini-DVI port, and is the only current MacBook to include a FireWire port. We updated the aluminum MacBook to OS X 10.5.7 and ran the various system updates released since the last time we tested that machine, and ran Speedmark again. The new white MacBook was just about 5 percent faster than the 2GHz Aluminum MacBook when tested using Speedmark, proving to be faster at nearly every task. With its slower 2GHz processor, it’s no surprise that the aluminum MacBook wasn’t as speedy at rendering a 3-D scene in Cinema 4D or encoding a MPEG movie with Compressor. But even hard drive tests, like unzipping compressed files were a bit slower on the aluminum MacBook. The one test in which the aluminum MacBook outperformed the entry-level model was our Quake 4 test. As both systems use 256MB of main memory, it makes sense that the machine with the faster RAM would have the advantage. The performance boost gained from jumping from MacBook to MacBook Pro is still considerable, with the entry-level 2.4GHz MacBook Pro turning in a Speedmark 5 score more that 10.5 percent faster than the 2.13GHz white MacBook. The biggest difference was in Quake 4 performance, where the MacBook Pro’s faster Nvidia GeForce 9600M GT graphics processor and 256MB of dedicated GDDR3 memory pushed through about 82 percent more frames per second than the white MacBook. Of course, at $1,999 the 2.4GHz MacBook Pro costs twice as much as the white MacBook, so one would hope to see significant differences. For comparison’s sake, I’ve also include results for a MacBook Air 1.8GHz in the table above. Apple’s ultra-thin notebook was 12 percent slower than the white MacBook in our Speedmark 5 tests. Check back soon for Macworld’s final rating of the 2.13GHz MacBook, which we’ll post in the next few days.